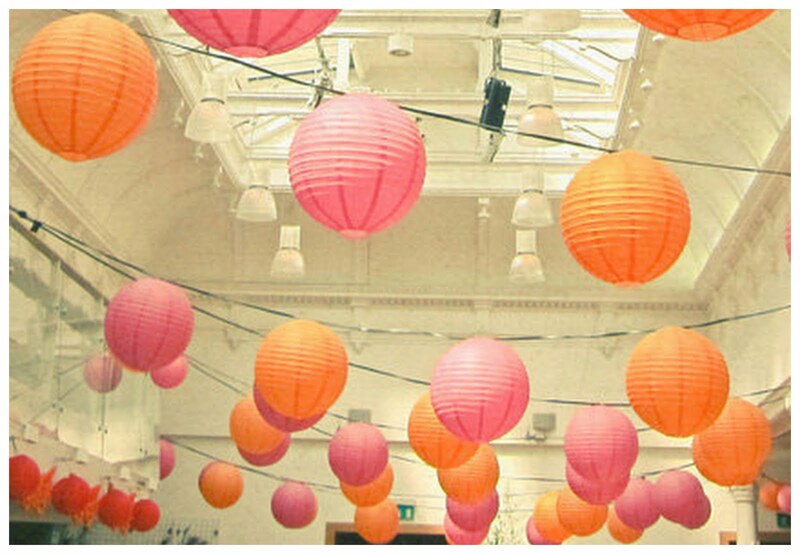 Apart from tissue pom poms, paper lanterns are my TOP tip for cheap and chic wedding decoration. I've always loved looking at them in wedding pictures, and a couple of weeks ago two friends used hundreds of them at their own French wedding. They had white lanterns in the garden, and a combination of peach, orange and yellow in the marquee. Every one had a tiny LED light inside, so as the sun set, they started to glow. It was a truly magical effect. I'll be featuring their wedding any day now, but in the meantime check out Hanging Lanterns to buy your own. If you enjoyed this post, why not sign up for our free newsletter and click for more wedding decoration ideas. Before the Big Day - the Best UK Wedding Blog. How can anyone fail to like paper lanterns? They're so versatile and work with loads of different wedding themes and schemes. Love 'em. Thank you for your comments - I'm totally obsessed with lanterns as decorations, as you can tell! Matthias - my friends used really thin wire - maybe fishing wire? I think you can get it from eBay. It worked brilliantly, as it was pretty much invisible. Thank You Before the Big Day Subscribers!